Marvel 9.5 cu. ft. Deck Box is rated 4.0 out of 5 by 33. Rated 3 out of 5 by Darby from Decent overall but... Assembly was simple enough, it looks nice and is doing the job I got it for. It is fragile, though, and breaks easily. Rated 1 out of 5 by Kristin from Bad hinges. The box itself is okay, but the hinges are terrible and the cover broke off within a month. It's all molded plastic so it's not fixable without replacing the whole box. Rated 5 out of 5 by rcml from Great Deck Box This deck box is super easy to install and serve its purpose perfectly! Rated 5 out of 5 by HappyCustomer from Perfect for the deck Easy to assemble, waterproof, lightweight and easy to move. Perfect for the deck!! Rated 5 out of 5 by Janice from Exactly as it is described Bought 2 more this year and just love them. Still have the ones I bought last year and yes they are waterproof including in the winter months. Luckily I was able to get them on sale for a great price. 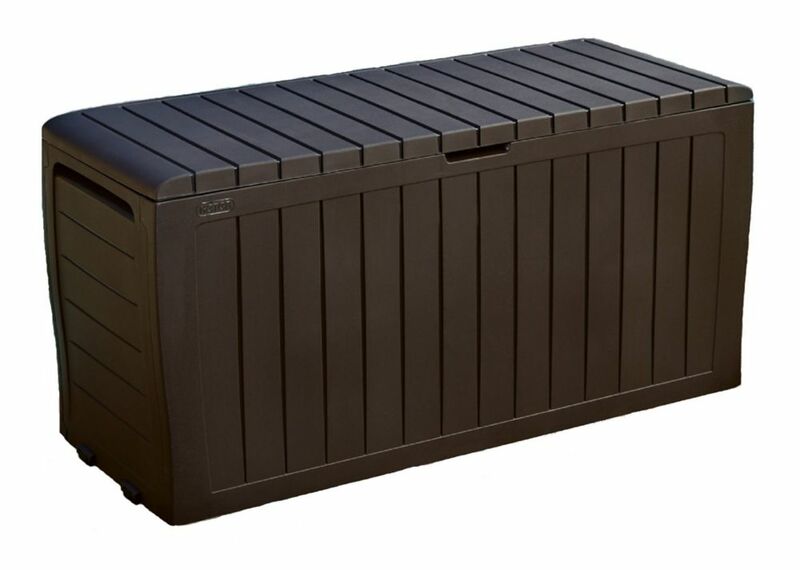 Rated 5 out of 5 by TNCCOACH from Perfect for outdoor patio storage I am not very handy when it comes to assembling things but this was very east. Just click click click, and it's done. Really light and fits perfectly under the eaves. Rated 5 out of 5 by Bambi from Great price and quality. Easy to assemble. Good quality. Fits a lot of cushions, etc. can this be used as a gas generator box to quiet it? Does the box have the option to put a padlock on it? Hello adelgado, No there is not way to lock this deck box. Is there anyway to padlock this? Hello Lisa, No, this is no way to lock this deck box. What outside temperature can this box withstand? ie. can it be left outdoors in the winter? Hello GGDel, Yes it can be left outside. Is it strong enough to be used as a seat? Hello, We do not recommend using this for a seat. can this be used as a planter? No. It is not built to the standards to hold large amounts of soil and plants. The joints would not hold such stresses. What is the depth, width and height?